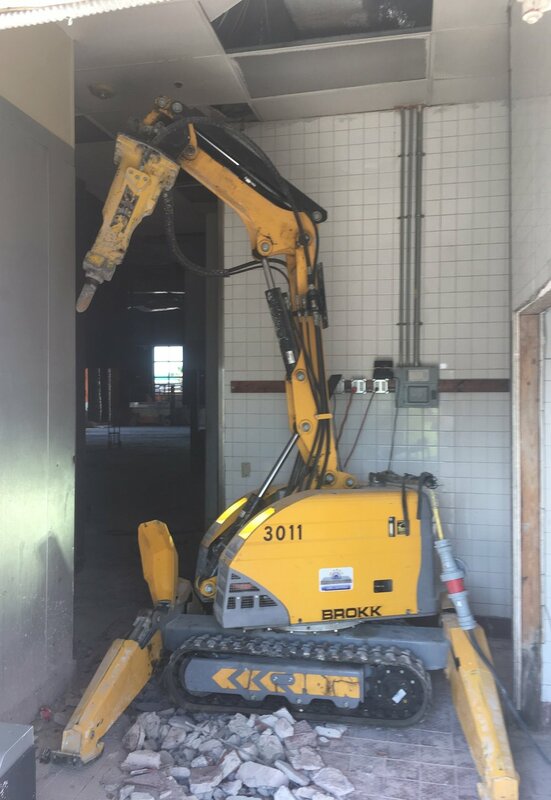 When you need demolition services on the interior of a building, Marek Sawing and Drilling offers a great option for breaking thick concrete with great ease using the Brokk, a robotic, electric powered demolition hammer. The Brokk can break thick concrete with ease and it's fume-free. This makes it possible for business to continue in other parts of the building while the interior demo is being performed. The Brokk can also work in tight spaces and it can maneuver stairs during the demolition process. When precision is necessary or space is confined during the demolition process, the Brokk robotic machines are the perfect solution. This is often useful inside of an existing building or warehouse where walls and floors or equipment foundations need to be repaired or removed without damaging the surrounding concrete. Exceptional operator safety due because the machine is operated with a remote control. The ability to perform interior demolition in tight spaces, accessing areas that other machines cannot. More powerful concrete breaking than a similar sized backhoe breaker. Multiple attachments for demolition including: digging buckets, shears, processors, grapples and concrete cutters. Excellent machinery for interior demolition, offered by one of the most innovative concrete cutting and drilling companies in Houston, will ensure that your interior concrete breaking and removal process is successful.